This wall needs to come down. Other side of the wall. TV room. Showing uncharacteristic restraint, I bounced the idea off Bernard before introducing it to the family and as I expected, he jumped right on board. With his professional opinion on my side, It didn’t take too much effort to persuade everyone else that this was a good idea, because with just a little imagination it was easy to see that removing the dividing wall would open up a beautiful, light space. 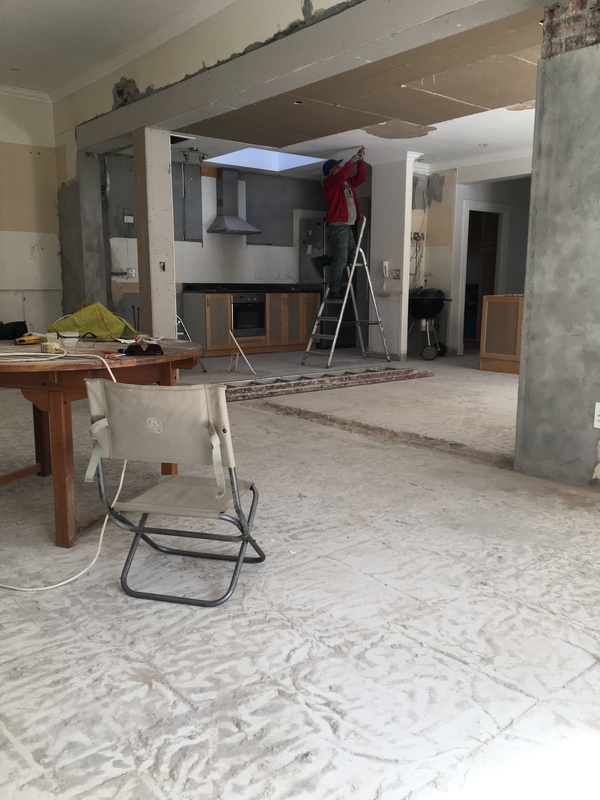 It did of course add all sorts of additional complications, not least of all being the necessity of bringing in a structural engineer and accepting that the existing (laminate) flooring would have to be replaced. It also meant that most of the kitchen would need redoing but that will be another story. View from kitchen. Steel beam in place. 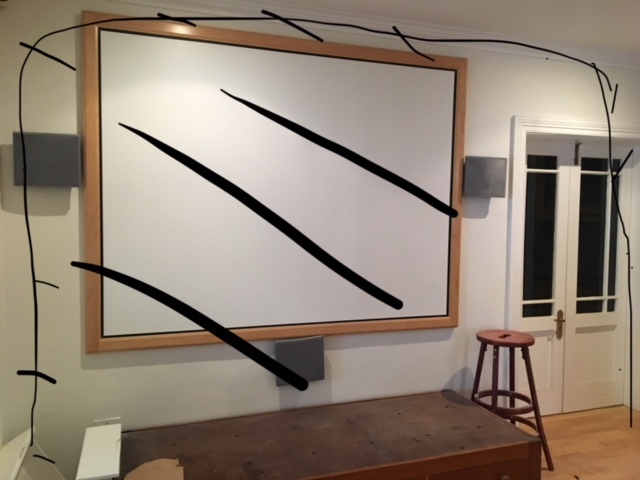 …to this. This small pillar will be thicker when complete. It can feel a little overwhelming at times and there is no doubt that I am thought by some to be just a bit crazy, but last week I felt absolutely vindicated. I asked a decorating friend to meet me at the house to discuss curtaining. It was her first-ever visit to the house and it was a relief to show her how things were and how they will be and to get an enthusiastic response from someone who just ‘gets it.’ In an earlier post I mentioned how the single window in the middle of the main bedroom wall had irritated me for years. Main Bedroom with additional window. I pointed out the additional window to Susie who expressed amazement that there had ever been only one. “It must have looked like the Eye of the Cyclops” she said. I rest my case. Parkhurst – Three Years On. It’s almost three years to the day since we moved into our new home and we’re still making lovely discoveries about Parkhurst, the interesting old suburb in which we now live. Expanding our walking radius we’ve discovered a new little park, complete with a swing. Resident Horses being led out to pasture early one morning. We’ve found a hilltop with views back over Johannesburg. Our house is somewhere in the trees on the hill in the photo on the right. We’ve found another bridge and some graffiti. A new stream for Daisy to swim in. We enjoy all this green space so close to the city. My mother’s bench has had several incarnations. I cannot remember where she found it or what condition it was in when she bought it, but it was always part of my childhood gardens and featured in various photographs over the years. It moved house a few times too as my parent’s lives changed, and eventually, when my mother died, the bench was shipped up to me. 1980-something in my parent’s garden. It survived the move from the coast to the Highveld and it survived our first house move too, but the next, involving three months storage in a warehouse somewhere in Johannesburg, proved too much for the antique cast iron and it was eventually delivered to Treetops in 3 separate pieces. 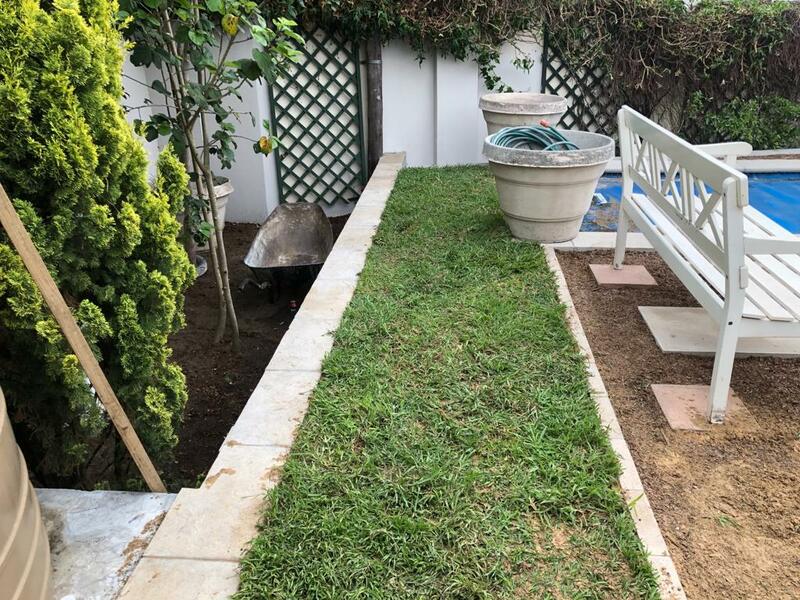 For the first year, busy with settling in, establishing a garden from scratch and just generally finding our feet in our smaller home and new neighbourhood, I was able to put the damaged bench out of my mind. But as time passed it began to reproach me from where I had hidden it behind the moonflower tree. My sister, on a visit from England, was mildly reproachful too, having clear memories of the bench in its heyday. I had asked a few people about the possibility of repairing the bench, including the metal workers who made and installed our driveway gates and the man who supplied and and installed our garden trellises. Both had given me the same response: While it’s possible to repair and weld wrought iron, it is impossible to weld cast iron. I had also discussed the dilemma with Sascha at Garden Bleu in Parkhurst and she had confirmed this disheartening information. Wrought iron, according to the OED and a few sources on Google, is a ‘tough, malleable form of iron suitable for forging.’ Iron that has been ‘wrought’ has been beaten out or shaped by hammering. Cast iron is the result of metal, often mixed with other components like ground glass or sand, being poured into a mould while molten. 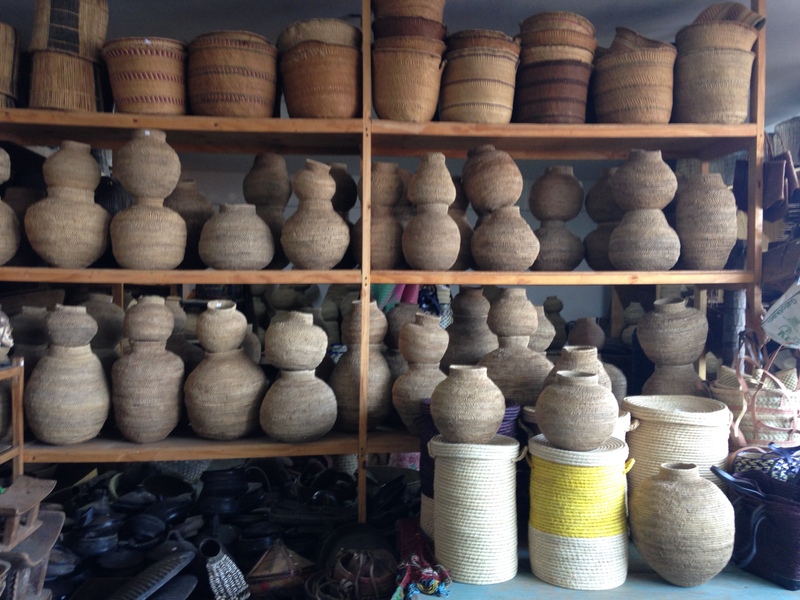 The end product is more brittle than wrought iron and can break or snap under pressure. Because it is not as ‘pure’ as wrought iron, it is extremely difficult to rejoin broken pieces. Discouraged, I pulled all the pieces of metal and broken wooden slats out onto the lawn and studied them. On close inspection, it seemed the metal had come apart cleanly in three places and I decided to have one last ditch attempt at finding someone willing to tackle the job. I had also done some research on the history of the bench and concluded that it was worth persevering. It is a Fern and Blackberry Bench, manufactured at the Coalbrookdale Foundry sometime in the 19th Century. I’m sure Sascha’s heart sank when I raised the subject again but after looking at the pieces herself, she agreed to bring her metal worker, Dirk Venter, to give an opinion. Dirk was dubious. He wasn’t sure if he would be able to get the joins to hold and he wasn’t sure if it was worth the effort. But for me, it was. I would have been happy if he’d only managed to wire the pieces together. He loaded the pieces onto his truck and I watched that well-travelled bench disappear up the the driveway and wondered if I’d ever see it again. That evening I got a message from Dirk with a very reasonable quote. He was willing to put the metal frame back together but I would need someone else to do the woodwork. He sent me a couple of photographs of the bench while he was working on it. Besides putting it back together, he needed to strip off all the existing paint – and rust – before repainted it. A few days later he delivered an almost unrecognisable bench back to me. Restored to its former glory, I have not been able to find any sign of the repair work. It looks magnificent. Then there was the question of where to put it. In the end the swallows had to be rehomed but they seem content in their new space. Dirk’s company is called ‘Staalwerk.’ In English, that is simply ‘Steelwork.’ It was an absolute pleasure dealing with him. After all the head-shaking and pessimism that had gone before, he was the one person prepared to give it his best shot and it was definitely worth it. I will always be grateful to Dirk for taking on this tricky, time-consuming project and to Sascha – with her endless patience – at Garden Bleu, who saw the potential in the bits and pieces. From a distance, it’s difficult to keep track of progress, just as it’s difficult to speed things up. 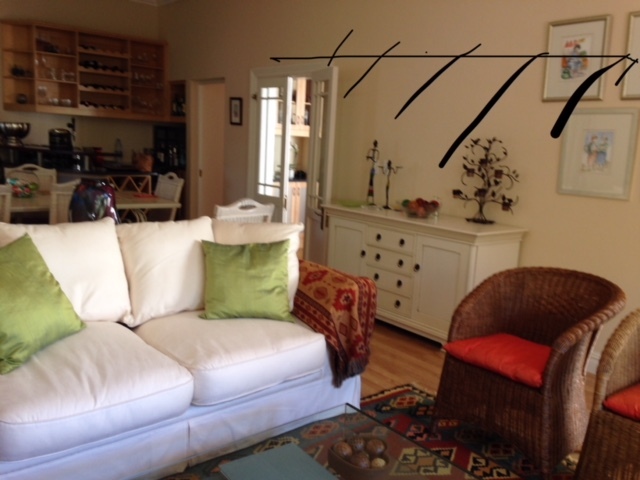 Our Cape Town builder sent us a couple of photographs this past week which do show some activity. The pool looks almost ready for filling. It will be a relief to get that ungainly water-bag (in the right hand top corner of the third picture) off the patio. It’s good to get an idea of how much more accessible the pool will seem, raised to almost the height of the patio. At last, building has started on the small, new bathroom. 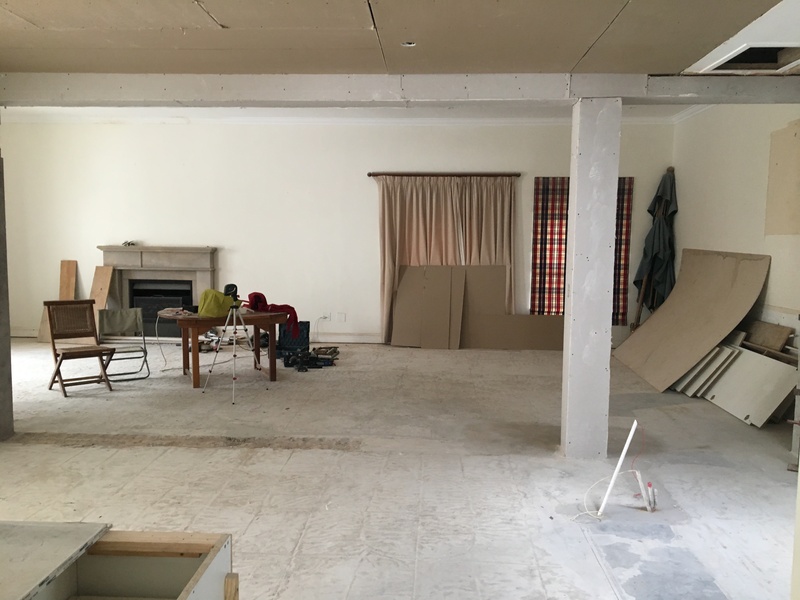 As this is the only part of the renovation which will be visible from the outside and which will alter the ‘outline’ of the house, I’ve been anxious to see it take shape. It is above this tiled roof that the new ensuite shower room is being built. Below are two pictures showing brickwork finally going up. Because concrete slabs were needed for both the floor and roof of this bathroom, we needed planning approval. The picture above shows the new bathroom window looking south towards the street. I hope the next batch of photographs will show some internal bathroom progress. My next ‘site visit’ is scheduled for April. Perhaps I’ll be able to speed things up a bit. Above on the left is the main bathroom as it was and on the right, as it looked yesterday. The main purpose of yesterday’s site visit was to confirm the position of all the new bathroom fittings. Here Bernard and the contractor, Paul, are making notes on the wall in permanent marker pen. The main bedroom, which faces north and has a good view of the mountain, has French doors opening onto an upstairs terrace on the east side but only one window, placed dead centre, on the north side. It has always bothered me. You can just see that window on the far right in the picture on the left. That window will be bricked in and two new windows will replace it. In the picture on the left you can see where the new windows will be positioned. And I can’t wait to replace that security gate on the French doors with shutters. Still upstairs, this was the study. A short passage, with linen cupboards on the left, led to the study door. The door has been pulled forward and the linen cupboards will now be bedroom cupboards. The hole in the wall on the right marks where the door to the new en suite bathroom will be built. Here are Bernard and Paul marking the position of the shower. I elected not to join them. I needed to fly home in the same clothes in which I’d arrived and as it was, I was not exactly spotless by the time we left. 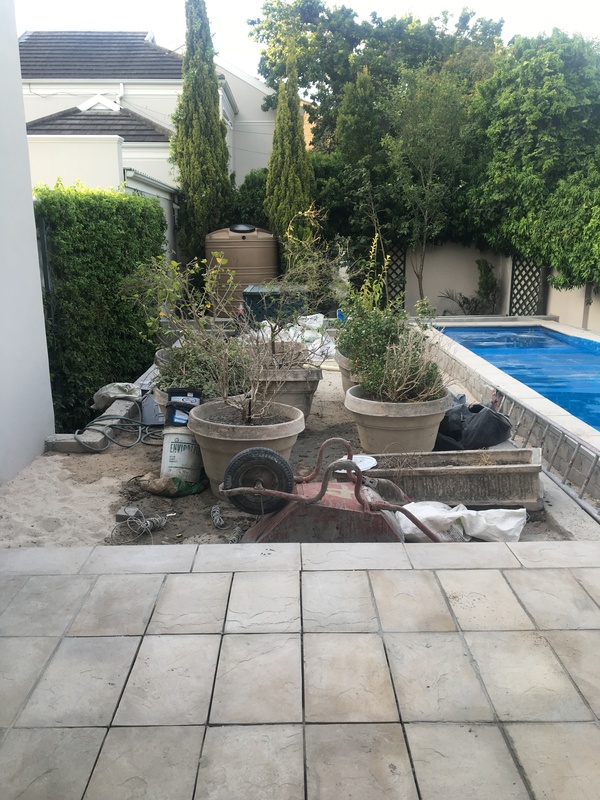 The level of the garden has been raised to the level of the patio and it has taken some time and effort to get it all filled in. The pool is starting to take shape in its more pleasing rectangular form. One of the two water tanks is visible in the back left corner of the garden. The white ‘mass’ in the two photos on the right is something called a ‘bladder.’ For want of a better description, it is a waterproof ‘bag’ resembling a huge waterbed. The water from the old pool was drained into the two water tanks and then into this bag and there it is waiting to be transferred back into the new pool when it is eventually ready. Long ago, in the days of plenty, I can remember swimming pools being emptied and drained into the street. I cannot even begin to imagine the outrage that would cause today. The downstairs bathroom before and how it looked yesterday. The downstairs bedroom which is being converted into a study, looking south across the passage. The bright light is from the kitchen door. Glass sliding doors have been ordered for this opening and bookshelves are to be built on either side of and above the doors. And finally the outside mini-bathroom is starting to take shape. I had hoped to see a bit more progress on the new upstairs bathroom. Now that the positioning of all the sanitaryware has been finalised, I trust there’ll be much prettier photographs next time. A Bit on the Side…. Not content with having come through one big building project not entirely unscathed, we have embarked on another. This is being handled at arm’s length though and so far, seems to be going reasonably well. Although I might feel differently when I eventually get down to Cape Town to see it firsthand. This picture shows the French doors leading from the dark downstairs bedroom opening onto the covered patio on the right. It also shows the drop from the patio to the garden and pool level. 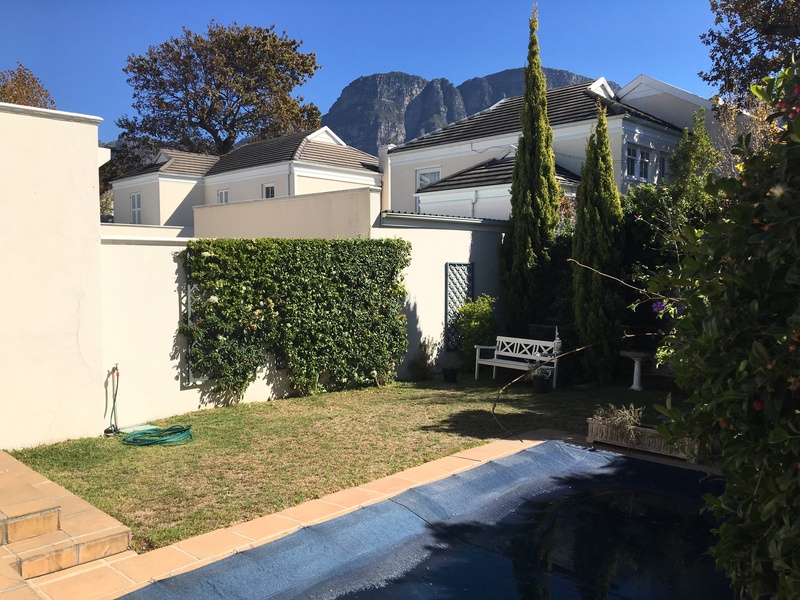 We have owned a townhouse – or ‘cluster’ – as they’re sometimes referred to here, in the southern suburbs of Cape Town for about 13 years. When our children were at university there it was a very useful base for us and we’ve used it for many holidays and breaks from Johannesburg as time has passed. This downstairs floor plan gives some idea of the shape of the stand and pool. It is a freestanding house in a gated group or cluster of 5 other similar homes and as such has been an easy ‘lock-up-and-go’ option. It has a small, compact garden and a pool to match. There had been only one previous owner before us and it was in good condition. 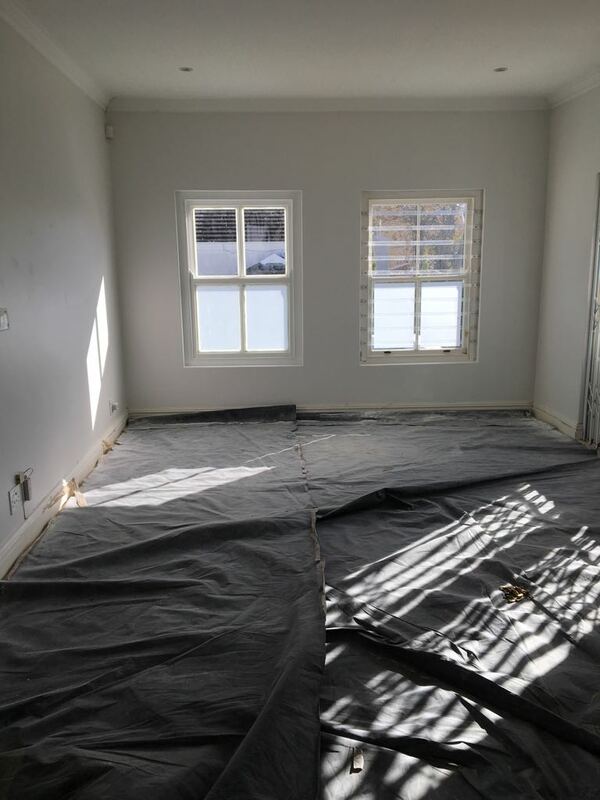 But as often happens when you buy a house, there are little things you know you would have done differently had you designed it yourself and just like some people have almost permanently itchy travel feet, I have permanently itchy ‘alteration’ fever. It can be quite an intrusive condition. I hardly ever walk into a house without immediately thinking about how it would look were a door or window in another place, if the house were turned back to front to give privacy to the garden and pool area, if it was plastered differently, if the roof was angled better, if it could benefit from skylights and if dividing walls could be demolished to make one, light spacious open plan room…. I never stop. Sometimes I don’t even have to go into a house before I start envisaging how it could look if tweaked a bit here and there. 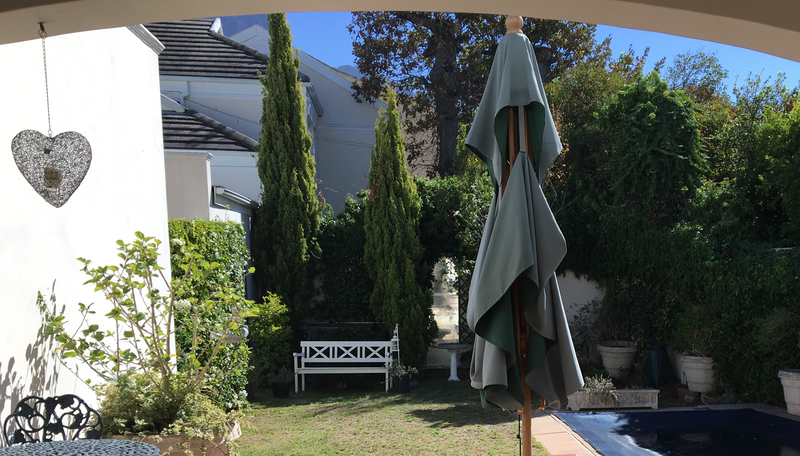 So it is no surprise that over the years we’ve owned the Cape Town property, I have pondered and wondered about it. From the day we moved in the shape of the swimming pool has irritated me. 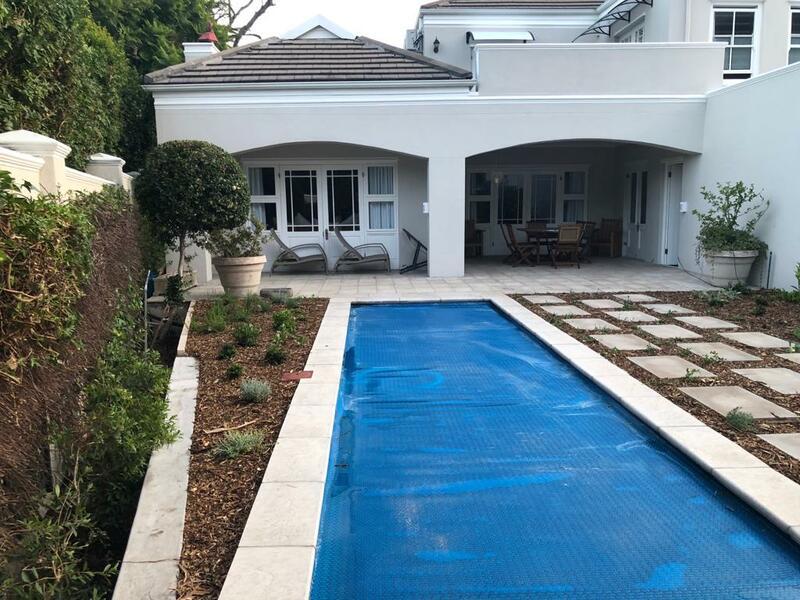 The garden is a slightly unfortunate wedge shape and someone in their wisdom thought it a good idea to have the swimming pool follow the curve of the garden wall. Now, about 17 years old, the pool needs extensive resurfacing and it seemed like a good idea to change it altogether. View from the small covered patio over the garden. Not possible to see the curved side of the pool on the right but possible to see that the patio needs resurfacing. One of the downstairs bedrooms had no direct access to light, only having French doors and windows opening onto a covered patio area. This has driven me crazy and I can’t even begin to describe the various ideas and harebrained schemes I’ve come up with to get around it. In the top photograph you can see the French doors on the right, opening onto the small, covered patio. It’s a three bedroomed, 2 bathroomed house with an additional guest toilet and basin (powder room in Americanese) and a study. The study and main bedroom en suite are upstairs and the study has the best outlook in the house, facing north towards Table Mountain. View from the upstairs study (soon to be bedroom) towards the southern aspect of Table Mountain. It’s all very well having a study right next door to the bedroom when we’re home alone, but when someone in the family gets on the phone to clients or worse, brings them to meetings at the house, it is not an ideal situation at all. 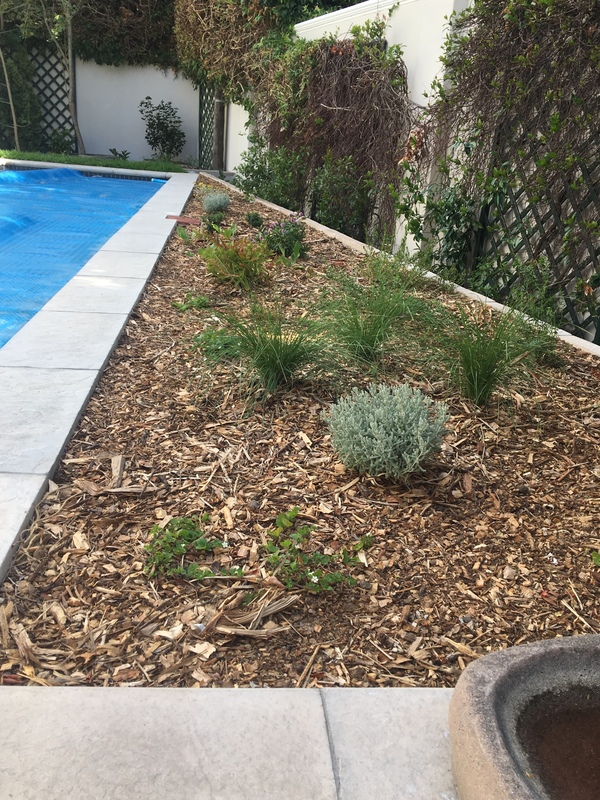 So, as happens, the renovation of the swimming pool became a renovation of the patio and garden which became a little bit more and a little bit more again. Passage/Hall wall on the right to be broken through with double glass doors. In a nutshell, the dark downstairs bedroom is being turned into the study. 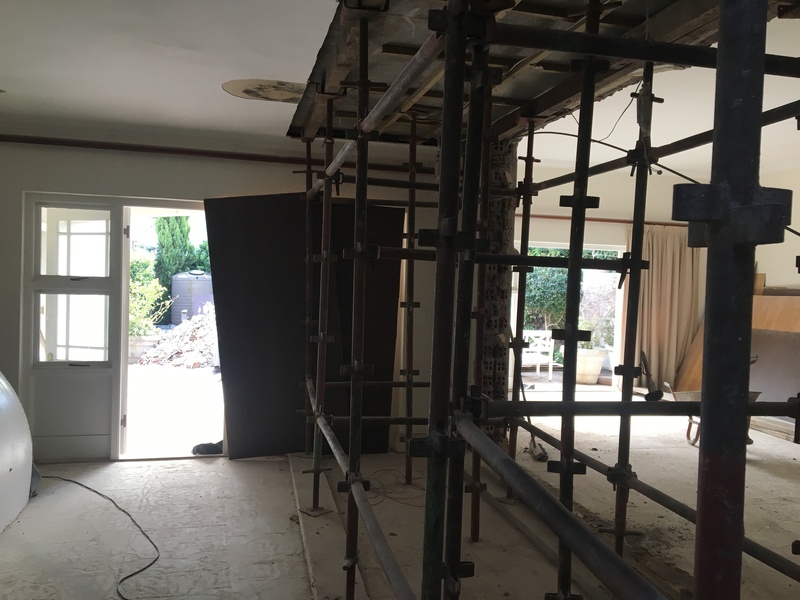 The door leading into that bedroom has been bricked in and the wall the bedroom shared with the passage (hall) has been knocked through to accommodate double, glass paned sliding doors. This way, that room will receive ‘borrowed’ light from the kitchen and hallway. The original bedroom door has been bricked up and the double opening knocked through. By moving the doorway of that bedroom, we’ve been able to convert the ‘family’ bathroom into an en suite for the second downstairs bedroom. The open door on the right has been bricked in as seen in the previous photo. The bedroom door beyond has been brought forward so as to create an ensuite bathroom which is not visible on the left. 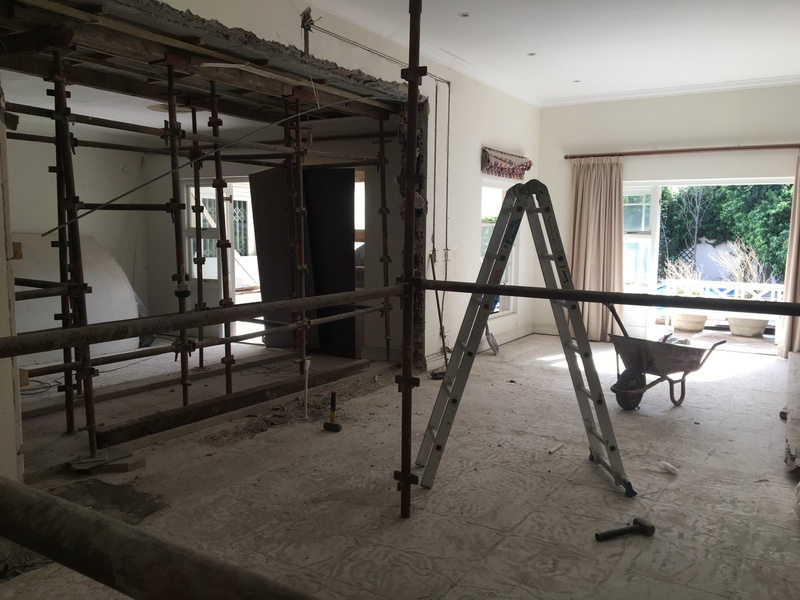 The upstairs study is going to become a bedroom and a small, en suite shower room is being built behind it, above the kitchen. In this way, it does not extend beyond the existing ‘footprint’ of the house. And since we were putting in a new bathroom and needing to slightly improve another one, we decided to do all three. The bathroom fittings were delivered before the builder was on site and without any warning from the supplier. Fortunately a neighbour was able to give the delivery men access to our garage but as it turns out, we’re a bathtub short and nobody wants to talk about it. Another issue I’ve had with the house and with the whole development is that there are no bathroom or toilet facilities for outside workers or labourers. 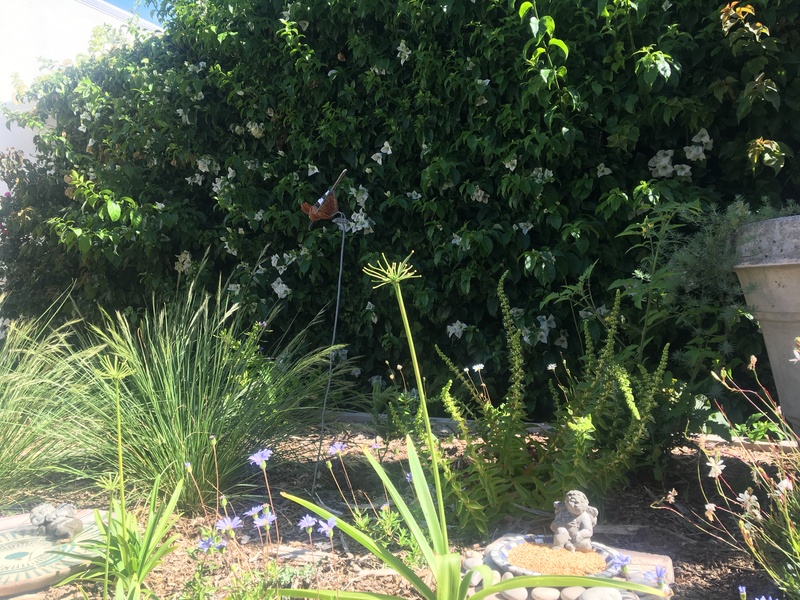 When the house is locked up and not in use, there is no access to a bathroom for the gardener who takes care of both our small garden and the common driveway area. For this reason, we’re adding a toilet and basin area in the little utility area behind the kitchen with outside access. Small washroom taking shape in the little drying yard behind the kitchen. So a small project has become quite a major one and the house is uninhabitable at the moment. Our lovely architect, Bernard Krige, has done all our plans and has been down to Cape Town a few times to check on progress. Down here in the Southern Hemisphere, all builders close for a month over Xmas and New Year so there is only a week to go before all work stops. They will start up again on the 15th of January and no doubt we’ll have to travel up and down a bit in the new year. 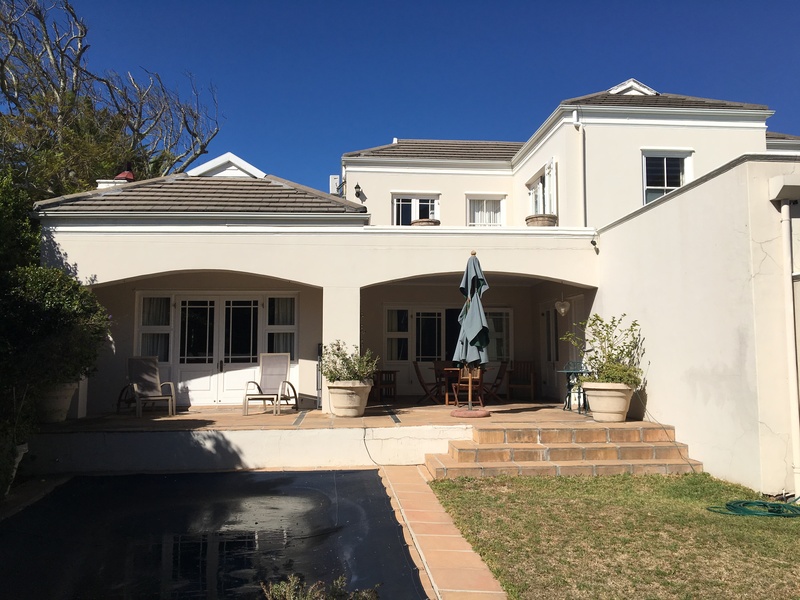 I am sure our neighbours will welcome the peace and quiet for a month but despite the houses being very close together, we have not had a murmur of complaint from anyone as yet which couldn’t be more different from what we had to deal with in Parkhurst. 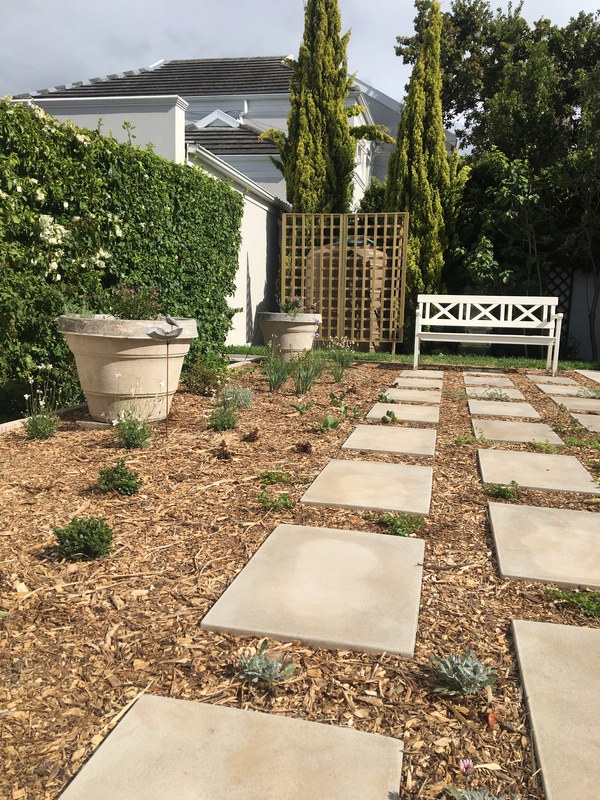 An absolute priority with this project is to make the small garden ‘water-wise’. Cape Town is in the grip of one of the worst droughts in history and there are draconian water restrictions in place. 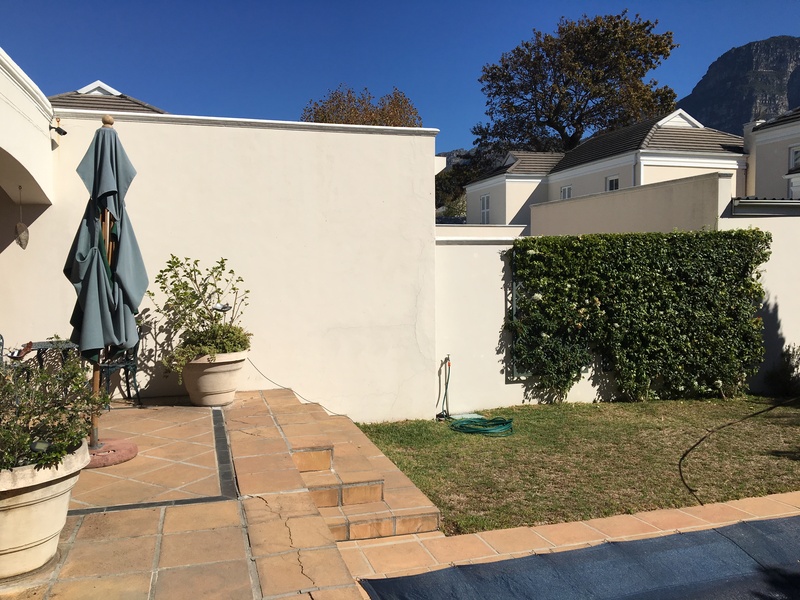 Since we’ve had such success with the water tanks we installed at Treetops, we’ve decided to install two smaller tanks in the garden in Cape Town. These will not be connected to a pump and filter system to service the house, but will hopefully provide water for the garden and for topping up the pool when necessary. 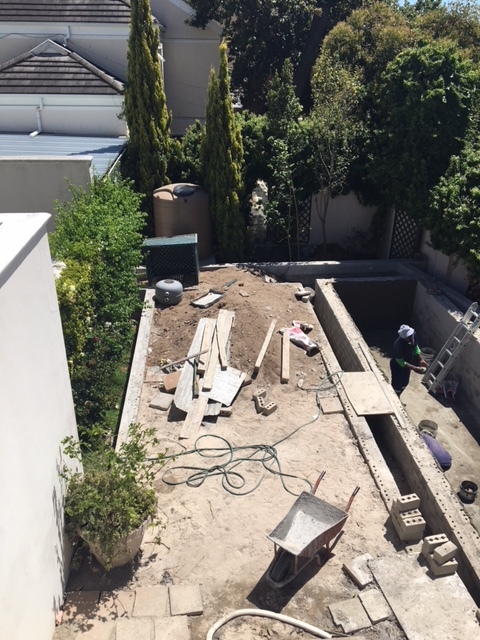 The pictures below, taken about 6 weeks ago, show the existing pool with the curved right side, the retaining walls to contain the future raised garden on the left and on the right, a water-tank-plinth-in-waiting. Unsurprisingly, there is a waiting list for water tanks in the Cape at the moment. 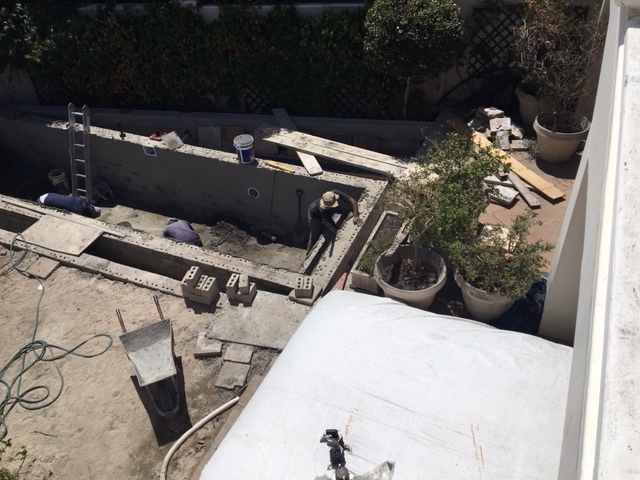 The plan is that when the time comes to empty the existing pool, we will drain the water into the tanks for storage until the new pool is ready. Sometimes I forget that our main motive when building Treetops was to downsize. With both our children living in London and two of us rattling round in a rambling home, it was time to ‘contract’ somehow. It wasn’t all about size. Over time, there’d been a growing awareness of excess, for want of a better word. For taking up more space than we needed to; using more electricity and water than we needed to; in general, just having more all round than we needed. Home for the last 20 years. We’ve been fortunate to have had no regrets. Sometimes I drive through my old neighborhood, just a couple of kilometers from where we are now, and I’m alarmed to see the changes there. 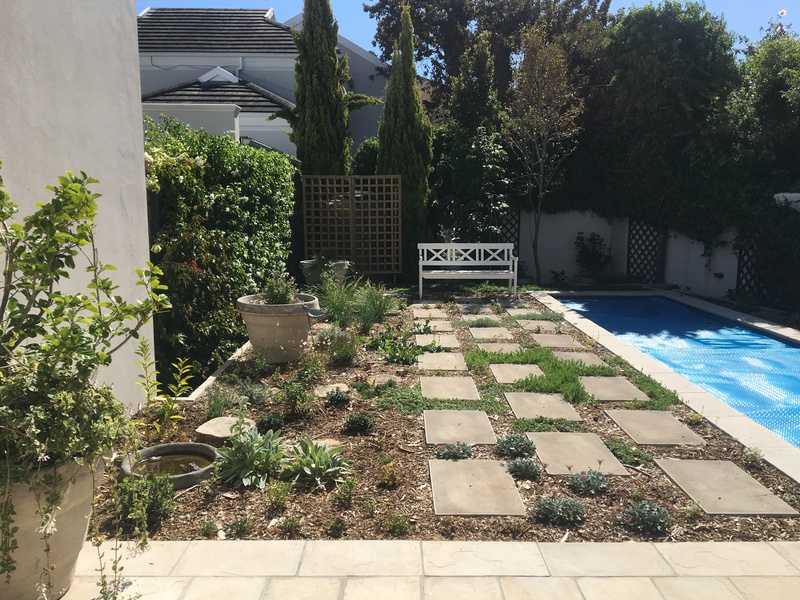 And that is in itself ironic because in moving to Parkhurst, we were seeking a more urban lifestyle; a neighborhood where we could walk to parks and nearby stores, cafes and restaurants and that is an aspect of living here that we thoroughly enjoy. Silk ‘n Swag, above right, specializes in Annie Sloan paint effects and can transform anything. But the urbanization I’m seeing in my old neighborhood is different. Huge office and apartment blocks are pressing up against the beautiful old garden boundaries of the lovely old homes there. Passing my old road last week, I was saddened to see that at least 4 gracious houses in old, established gardens have been completely demolished to make way for what seems to be a huge new development. Downsizing did come with some challenges. Some things were difficult to part with but I must admit to missing nothing other than one or two old books I’ve looked for without success. They must have gone the way of charity shops but if I really, really need them again, there’s always the library or if necessary, new copies. I derived much satisfaction out of being able to re-use some of the fabrics and other items from my old home in new inventive ways. My sister got a table cloth made from damask curtaining and a friend’s housekeeper has done wonders with our old dining room curtains too. She proudly showed me covers she had made for her sofa in her township home. One of my silk bedroom curtains looks beautiful re-invented as upholstery on a little bedroom chair. From a gardening perspective, I derive more enjoyment out of this much smaller garden than I did from the almost acre of ground I had before. 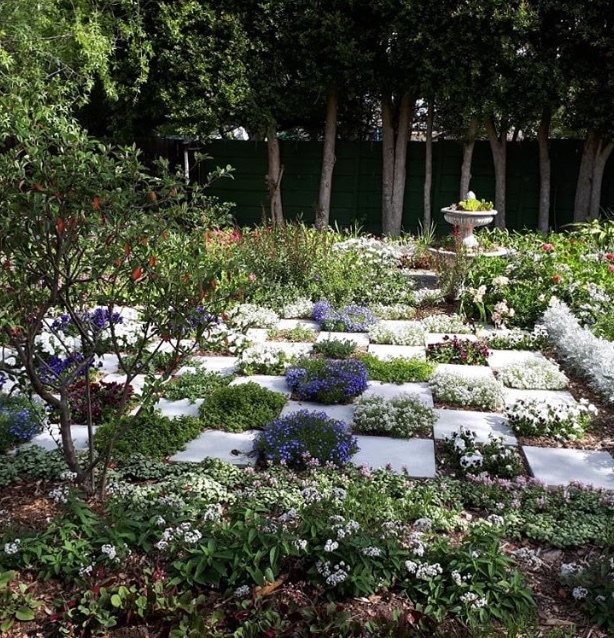 It was a lovely, old established garden but very difficult to maintain and a whole day’s work in it made little impact. 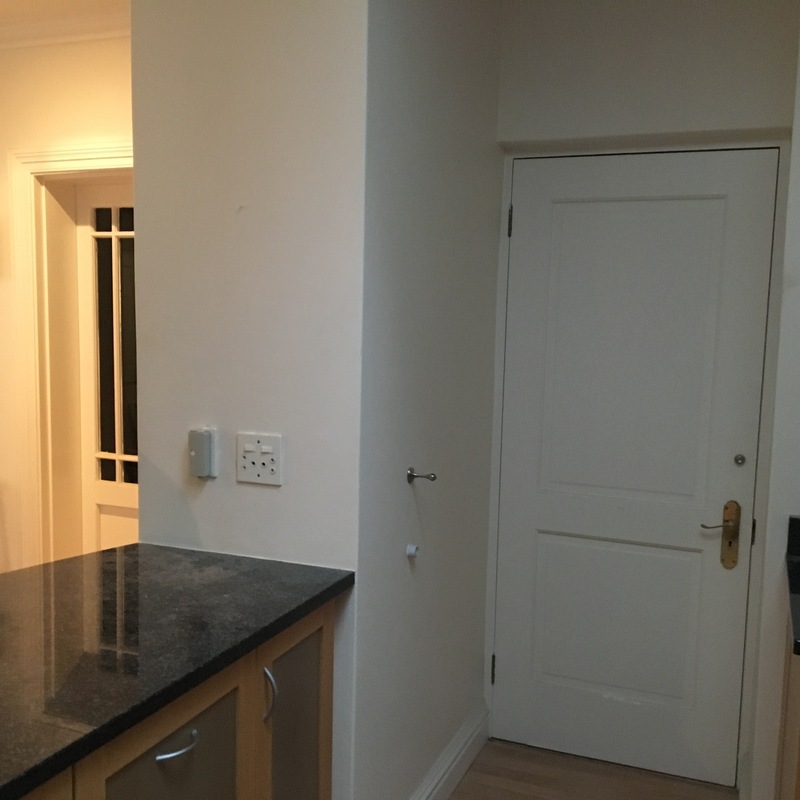 Perhaps one of the biggest challenges of this property has been its width. This stand is 55 meters long and only 15 meters wide. This has meant that there are narrow pathways down either side of the house and an even narrower ‘service area’ down one side of the guest suite which is above the garage. And this is where I have found mirrors to be absolutely invaluable. Opposite view from North to South. Taken from almost the ‘park’ wall. The picture on the left above shows the site from south to north, and the one on the right from north to south. They give some idea of the width of the property and looking at them now is enough to give me nightmares. The little picture above shows the narrow alleyway on the east side between the house and the boundary wall. This was particularly challenging to deal with. While the rooms in this house are bright and light, they are also more compact than what we were used to and careful use of mirrors has helped to reflect and bounce light around, giving some areas a sense of being more spacious than they actually are. Having the lovely view above from the main bedroom, I disliked ‘losing’ it if I were facing the other way. Bringing in the mirrors below has solved that problem, meaning that I catch glimpses of the park from almost anywhere in the room. Below is the view I was presented with when standing at the scullery sink. This window faces out onto that narrow path on the east side Granted, having the walls painted grey is an improvement on the dark alleyway appearance in the earlier photograph, but this wasn’t at all inspiring. Like most things, I knew exactly what I wanted to do here, but it took some time to get around to it. Below is the outlook with which I am now presented from the same position. The ‘window-like’ mirror is mounted directly opposite the scullery window and reflects a shelf mounted below the outside window sill and two wall-hung pot plant holders on either side of the window. This is possibly the most satisfying result I have had using mirror reflections so far. Then, when going up or down the stairs, I felt the alcove leading into the guest toilet needing brightening. The mirror there not only reflects light, but also offers another view of the Behero baskets under the stairs. Below is a mosaic of the main en-suite bathroom showing before and after mirrors. The third photo is taken into the mirror on the toilet wall. It is high enough not to reflect the toilet itself when one is actually seated on it, but positioned where it is, it is able to ‘give back’ the view of the shrubbery outside. We spend a lot of time on the veranda, regardless of the weather and I soon found that sitting on the ‘west’ side of the table gave one a very limited outlook. It was time for another mirror. This one throws back aspects of the veranda behind. Then, another table and another dead space. This time to the south…. Now, when sitting at the dining room table, I can see bits of both sides of the garden, north and south. It is much more satisfying and I love the ‘porthole’ effect of that round mirror. But sometimes there are ‘errors of judgement’ which brings me to the guest suite above the garage; the space I hope to one day list on Airbnb. There are two small windows behind the galley kitchen. With hindsight, I would probably have bricked them in, but I suppose, if anyone was to cook in that kitchen on a warm night, it might be good to have the option of opening them. Only, the outlook was dire – straight on to a roughly-plastered grey wall about an arm’s length from the windows themselves. Undaunted, I decided to try mirrors. I found two round ones which I thought would encompass the space and with considerable difficulty and husband-help, I got them hung… It was not a success. I remember reading an article many years ago suggesting that mirrors should only be used where they reflect something attractive or interesting. This experiment proved that point. I changed tack. The first time I tried a garden mirror was in our small Cape Town garden. It is a compact garden, enclosed by high walls and just by way of experiment, I mounted a long mirror on the shady back wall. It worked in that it did offer an oblong of light in a dark area and gave the illusion of a gateway leading to another space. Some visitors to the house were taken in until they got quite close to it. The mirror is the narrow band of light behind the birdbath. So it didn’t take long to decide to try one of the round mirrors on a garden wall here. The garden is looking a little wintry still, but once the leaves on the various shrubs have come out and the plants in the container below have gained height, I think it will be fun to have ‘window’ glimpses through the foliage. Once again, I like the ‘porthole window’ effect. We’ll wait to see how it blends in over the next few months.